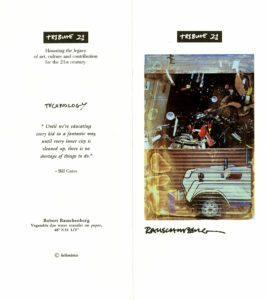 In October 1994, a number of luminaries in the fields of art, politics, fashion, and commerce gathered in Robert Rauschenberg’s Lower Manhattan studio to witness the unveiling of Tribute 21, a series of twenty-one poster-size prints the artist had produced for a newly formed humanitarian aid project, also called Tribute 21. 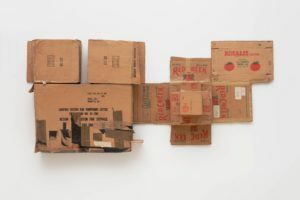 Conceived by Japanese corporation Felissimo and bolstered by Rauschenberg’s artistic vision, this initiative sought to harness art’s power to promote social, economic, and cultural development and improve social conditions at the dawn of a new century. Felissimo’s expansive vision embraced nearly all aspects of modern life, aiming to engage “music, cinema, children, health, technology, dance, nature, labor, environment, and space,” to name but a few of the areas listed in the organization’s promotional literature. Given his stature as an artist and his long-standing involvement with humanitarian causes, Rauschenberg was the perfect representative for this ambitious project. Produced in collaboration with master printer Bill Goldston at Universal Limited Art Editions (ULAE), each of the Tribute 21 prints highlights an individual whose contributions to his or her respective field signaled a commitment to building a more peaceful, just, and flourishing society. Given the issues Felissimo hoped to engage, the list of honorees represents a suitably vast array of cultural figures and occupations, including Mikhail Gorbachev (Peace), Bill Gates (Technology), Al Gore (Environment), Bonnie Blair (Sports), and Toni Morrison (Literature). 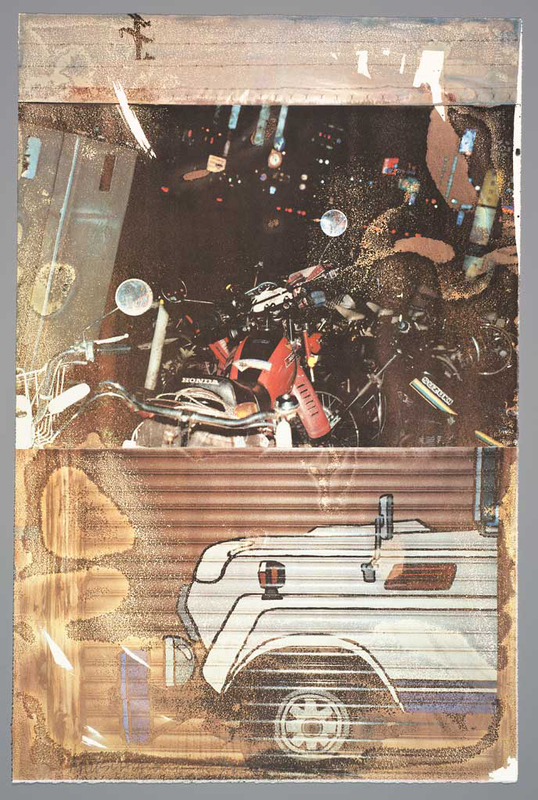 In keeping with his focus on environmental issues (another cause supported by Felissimo), Rauschenberg attempted to produce Tribute 21 sustainably, printing the images using special, less toxic dyes, and primarily using water (instead of chemical solvents) to transfer them to paper. It is the use of water-based methods that lends the Tribute 21 prints their distinctive fluid texture and overall “distressed” or oxidized feeling. Each print is divided into two or three segments loosely joined in a collaged structure that allows for the combination of unexpected visual elements. In most cases, the imagery bears only a passing connection to the work’s celebrated subjects. Nature (Jacques Cousteau), for example, features an image of a falcon in profile atop a close-up photograph of what appears to be grain but also suggests feathers or other organic material. 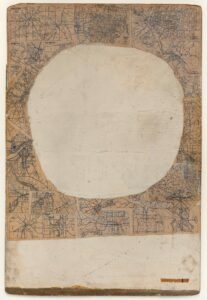 The two slightly overlapping images, both produced at nearly full bleed, share a rich brown-gray palette. 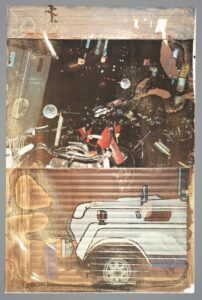 Aspects of the images collapse into one another, underscoring the sense of permeability that is further emphasized by the smooth, almost burnished quality of the print. Other prints more explicitly allude to their respective individuals and themes. Space (Carl Sagan) features an astronaut hovering within an interplanetary landscape, while Human Rights frankly signals Nelson Mandela’s apartheid-era imprisonment with a foreboding chainlink fence. The names and themes referenced in Tribute 21 conjure an expansive world view, each pairing clearly shaped by Rauschenberg’s broad, populist vision of an interconnected world best influenced through the power of art. Alan Riding, “Politics, This Is Art. Art, This Is Politics,” New York Times, August 10, 1995. Eduardo Cicelyn, “Tribute 21: In nome degli altri,” Interviu, 1999. Eduardo Cicelyn and Mario Codognato, Rauschenberg a Napoli (Naples, Italy: Associazone Dogana, 1999). Kelly Crow, “Museums Compete in an Unlikely Twitter Olympics,” Speakeasy (Wall Street Journal blog), August 3, 2012. Accessed June 23, 2013. https://blogs.wsj.com/speakeasy/2012/08/03/museums-compete-in-an-unlikely-twitter-olympics/. This listing documents select references that provide general information about the series. It has been updated since the launch of the Rauschenberg Research Project and is complete as of August 31, 2016.